After church Edith and I strolled all afternoon up and down the Pearl St. 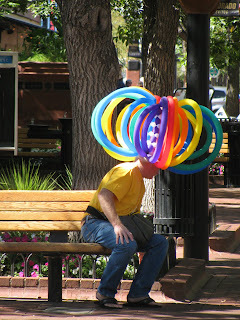 Mall in downtown Boulder. It has the distinction of being the very first pedestrian mall in the country with its first two blocks closed to traffic in the mid-1970s. I remember walking on it then and thinking it was just the coolest thing ever. Today it extends several blocks and is a mix of independent stores intermingled with some larger chain stores. For years, the chains were kept out, but times change, rents rise, and the chains have moved in...sigh! My second** favorite independent bookstore in the whole world, the Boulder Boostore, still anchors one corner, though, and I intend to visit it today. 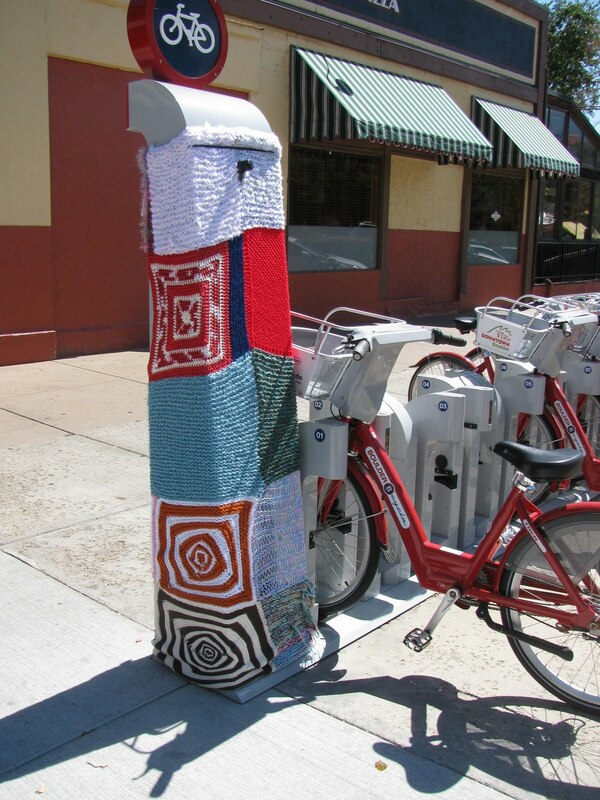 According to Edith, this photo captures the latest in urban graffiti...knitted 'cozies' for parking meters, mailboxes, etc. This one covered the 'rent-a-Boulder-bike' ticket dispenser. I kind of like it better than the usual paint 'tags' you see on the sides of buildings. Buskers abound on the Mall...drumming, playing guitars. dancing.The balloon man has a unique way of advertising, don't you think? I love that you saw that ... yarnbombing is a bit of a rage in the knitting world and I'd love to do it sometime.